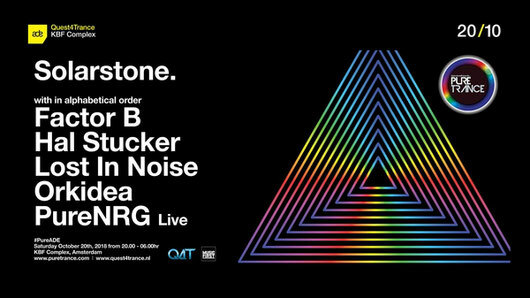 Solarstone is proud to represent the ever-growing and beloved Pure Trance movement by hosting yet another ADE special. For the 7th year in a row, you’ll find his Pure Trance night high on the ADE agenda. On October 20th, in collaboration with Quest4Trance, Pure Trance ADE 2018 lands at the KBF Complex, close to downtown Amsterdam. In addition to all things Pure, Solarstone’s will be celebrating his very own birthday! Hosted by Solarstone, you’re welcome to join for an all-nighter that’s all about the emotion and feel-good atmosphere of Pure Trance, with an ADE exclusive line-up of international trance names, extended sets, & live performances.